Now, we all know that fleas bite and that they itch like crazy when they do! They are also amazingly resilient so ideally, you want to avoid a potential flea invasion at all costs. Unfortunately our furry friends can have a habit of bringing in a few uninvited guests and those flea bites on your pets and even on yourself can, unfortunately, be the very real indication that a flea infestation could occur in your home. Fleas are a tiny 'holometabolous' insect, which is the scientific way of saying they are blood suckers that feed on animals and humans (cue the creepy crawly shudder!). You may not know this, but there are many different types of fleas. There are dog fleas, cat fleas, rabbit fleas and even human fleas. As strange as it may sound the names do not really give us much of a clue as to which which type of flea you have. For example, cat fleas, (Ctenocephalides felis), are the ones most likely to infest dogs! 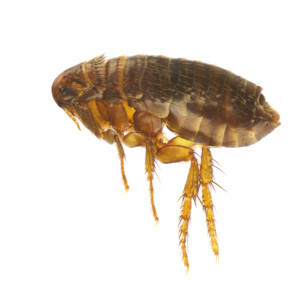 Quite simply all species of fleas are happy to feed on the blood of pretty much any mammal, not just the one they are named after, so if you find a flea bite on your ankle, it is just as likely to be a dog or cat flea as a human flea. Adult fleas are approximately 2.5 mm long and range in colour from dark yellow to reddish brown depending on how recently they have eaten. They have tall, thin bodies which, allied to their strong legs, allow them to move through animal fur quickly. This allows them to evade an animal's teeth or claws as they scratch and remove the pest. They move so fast that they are usually only seen as brief glimpses as they scurry through the animal's coat. There is an exception to this in the shape of the stick fast flea (Echidnophaga) which locks on to the host, usually on areas that are lightly furred or feathered such as the legs, eyelids or ears. Unlike many insects, fleas have no wings and cannot fly but they are capable of jumping enormous distances for their size; they can leap as high as 22 inches. Fleas do this by storing energy in an internal spring. When they are ready to jump, they unleash this built up power through a latching mechanism, which they release through their long rear legs. Amazingly we still do not fully understand how this mechanism works, but boy does it work - they can leap as much as a hundred times their body length! It has been said that this would be like a human leaping over the Empire State Building, but in fact it is a little less than this, but still an incredible feat and allows fleas to find their way on to new hosts with ease. Fleas are not easy creatures to eradicate. The visible adult fleas typically only account for about 5% of the fleas in an infestation (that's 1 in 20) The rest are eggs, larvae or pupae and if you don't take care of these too, then they will grow up to replace the adults you have spent time getting rid of. 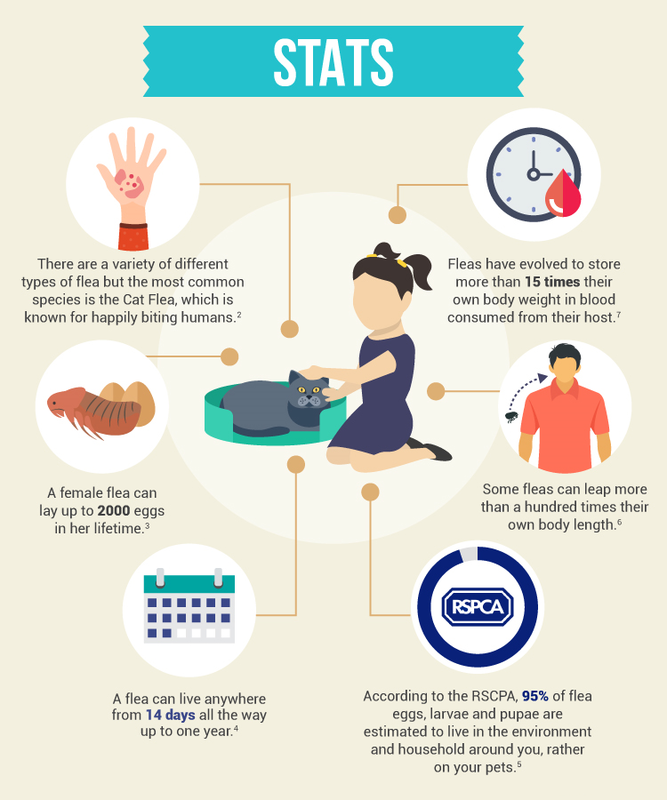 So without treating all stages of the flea lifecycle, it is impossible to break! A female flea will lay eggs after she's feasted on a nice meal of human or pet blood. After her meal, she will usually stay on her host and lay about 20 eggs. These eggs are smooth and oval shaped. They usually drop off the host and into the local environment, often your house or garden. In the home, the eggs will fall into the carpet or floor cracks until they're ready to turn into larvae if left untreated. The flea eggs hatch within about 12 days if the temperature is warm enough. They then hide in the carpet and cracks in the floor, living on skin particles and the flea dirt (flea faeces) that adult fleas drop after feasting on you and your pets. Once big enough, typically after about eight days, the larvae will spin a cocoon and turn into pupae. The pupae wait for the right time to hatch when the temperature is warm enough or they sense a suitable host nearby. They can stay in this state for up to 12 months, waiting for the right conditions to hatch! As soon as the flea hatches it looks for its first host and meal. Within days of finding a good host they are ready to breed and the cycle starts again. Firstly, if you think you may have been bitten by fleas yourself then take a look at our article on treating flea bites on humans and bed bug bites to help identify the culprit and address the itching bites. Once you have taken care of the bites, it is time to take care of the culprits. Of course, you could call a professional exterminator, but with a bit of perseverance, you could achieve the same results for a lot less money. The key steps to getting rid of fleas for good are as follows. To get rid of the adults you need to treat all the places they live in your house. So firstly treat pets with a good flea treatment (you can read our comparison between the three biggest selling spot-on treatments here) or similar spot on treatment. Be careful that you use the correct treatment for your pet as some can be harmful e.g. some dog treatments are toxic to cats. Next, spray all the carpets,curtains and soft furnishings in your house with a good flea spray such as Indorex. Don't forget pet bedding is often a hotspot for fleas so make sure you thoroughly wash and treat all your pets bedding and places they spend a lot of time. This initial barrage should kill the adult fleas and larvae, but if any eggs or pupae remain they will hatch and re-infest your home. This is where most people that are unsuccessful fall foul - they do not follow up to make sure there are no eggs left. 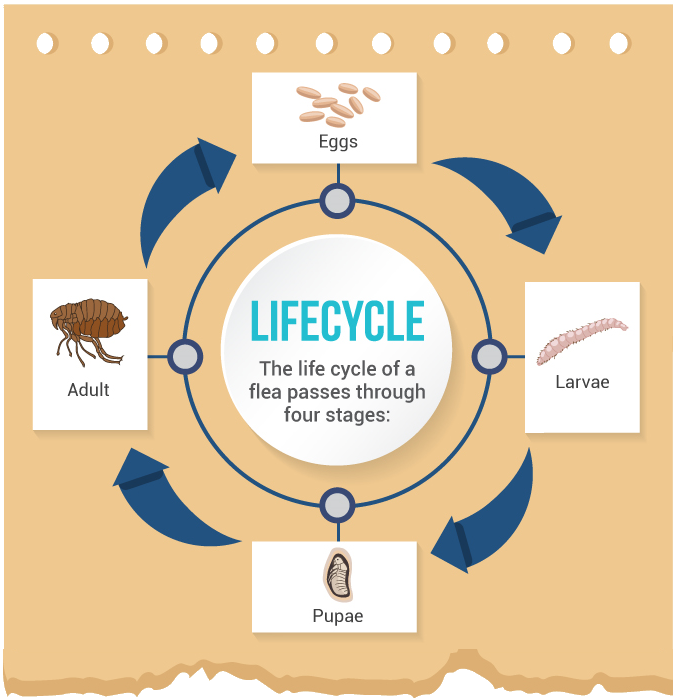 As can be seen from the flea lifecycle, fleas are extremely resilient and while you may kill the adults, the eggs are still lurking and any that survive will soon hatch and start adding more eggs. To get rid of the eggs you simply need to vacuum, vacuum and vacuum! Your house should be vacuumed thoroughly at least once a day, for at least a month after your house and pets have been treated. We cannot stress this enough - vacuum!! Once a day for a month might seem like overkill, but even one egg can be enough to see your house become re-infested, so a month of vacuuming seems like a small price to pay for the lack of itches!! 1 What are fleas exactly? 2 What do fleas look like? 4 How to get rid of fleas?